Food systems are, in a basic sense, as old as life itself: an ecosystem, however small, is ultimately a food system, as Fritjof Capra has observed (Capra 2005:34). Among the most significant ecological effects of human populations has been the stretching of food systems across great tracts of space. Human beings have been doing this for centuries, even millennia, as the Roman grain trade, the spice trade, and the Columbian exchange demonstrate. Thus, large-scale food systems are not historically novel. Nonetheless, the past 200 years or so has seen a significant material transformation in how food is produced, processed, stored, and distributed. Food systems have become truly globalized, mechanized, and industrialized. These developments have produced large-scale, historically novel “ecotechnical” systems. These systems in turn operate as new environments within which natural selection operates. Food systems thus demonstrate how differences in scale produce emergent phenomena. The first and most obvious aspect of this transformation is distance. While some food in the ancient period travelled significant distances, most food today is consumed a long way from its site of production. A 2002 Worldwatch Institute report noted that the average American food item travels between 1,500 and 2,500 miles from farm to plate (Halwell 2002). One oft-cited Swedish study from 1993 found that the components of a typical breakfast—apple, bread, cream, orange juice, sugar, and so on—travelled a distance approximating the earth’s circumference before consumption (Pfeiffer 2006:25). This great expansion of the distances traversed by food was a consequence of the development of steam and internal combustion engines, meaning that today’s food systems are heavily dependent upon fossil fuels. In contemporary America, 17 percent of all energy is used for the purposes of feeding, a figure divided roughly evenly between production, processing, and distribution/cooking (Nye 2006:82). The total energy cost of food thus significantly exceeds that of its production (Smil 2006:52). The high-energy food economy allowed foodstuffs to move around the planet at historically unprecedented speeds. 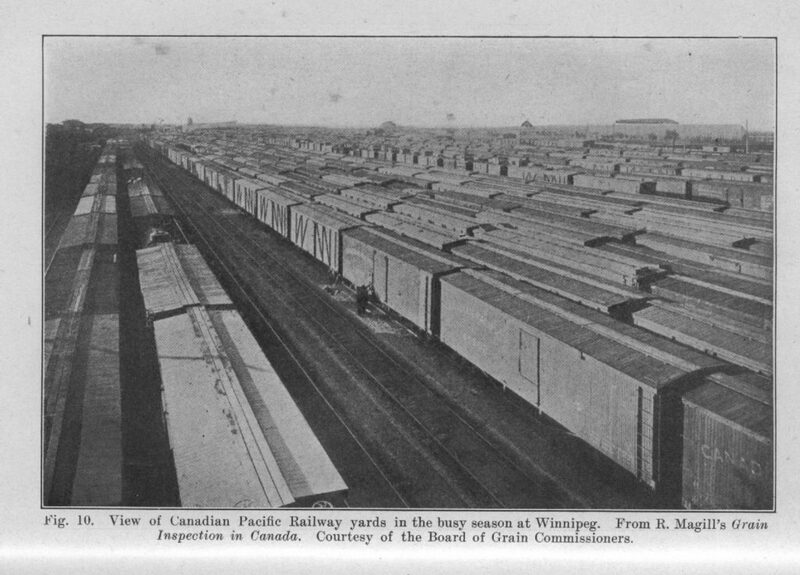 In the nineteenth century, for example, railroads and steamboats allowed the transportation of live animals across North America or the Atlantic Ocean. Time, contemporaries were fond of saying, was annihilating space. 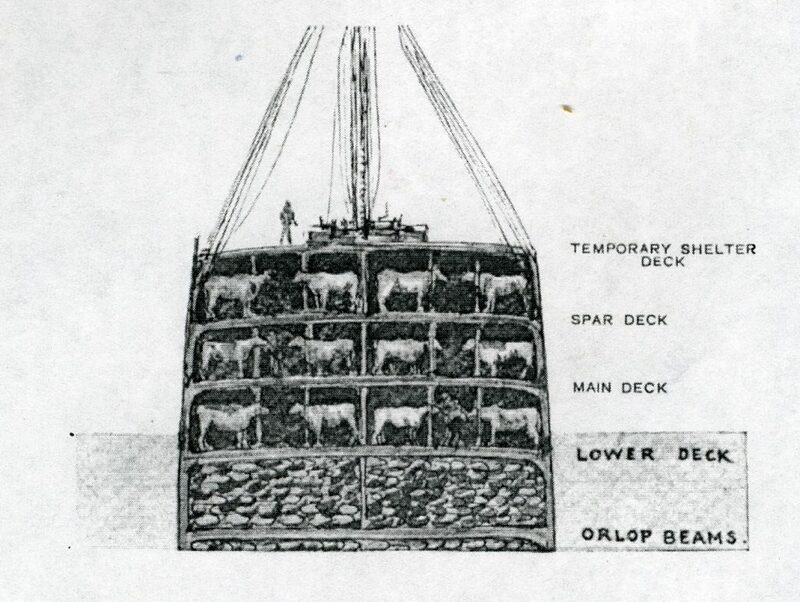 Cattle traveling on such ships would not have agreed: the journey was long and difficult, with illness and injury often decimating herds en route: in 1886, 5,907 animals had to be thrown overboard during Atlantic crossings (Bear 1888:93). Meanwhile, these systems efficiently distributed unwanted diseases like rinderpest and foot-and-mouth disease across greater distances, leading to a wave of European epizootics and emergency public health strategies ranging from culling to trade embargoes. 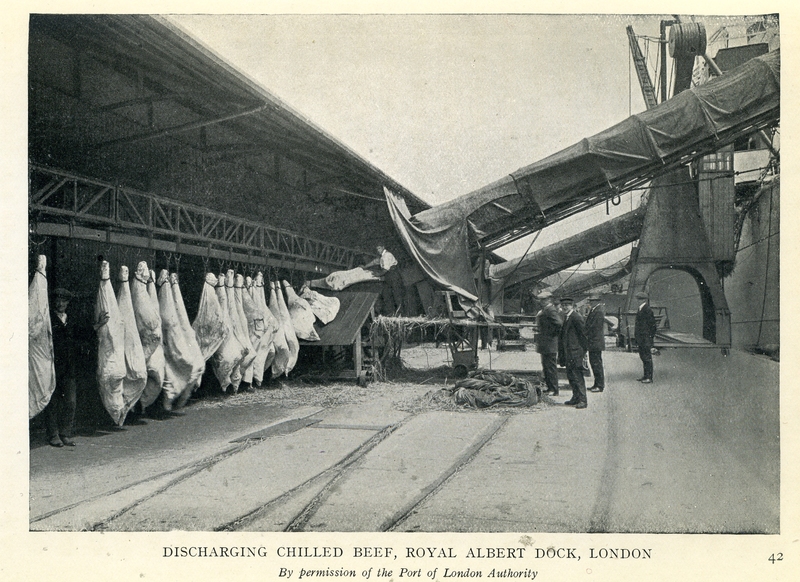 Transporting dead meat was promoted as more safe, efficient, and humane, but this raised the question of decay. The ultimate solution, mechanical refrigeration, was fully functional by the 1880s and was soon being used for the transportation and storage of meat, milk, and fruit through a “cold chain” that wove abattoirs, dairies, trains, storage depots, and delivery trucks into a relatively streamlined network characterized by calculated temperature control. The cold chain arrested decay and made foods more durable. Durability was also increasingly engineered into foodstuffs themselves through the use of preservatives, pasteurization, wrapping, and other techniques. The emerging spatial pattern thus involved extremely elongated transportation and distribution chains linking large hubs where foodstuffs were stockpiled and processed. 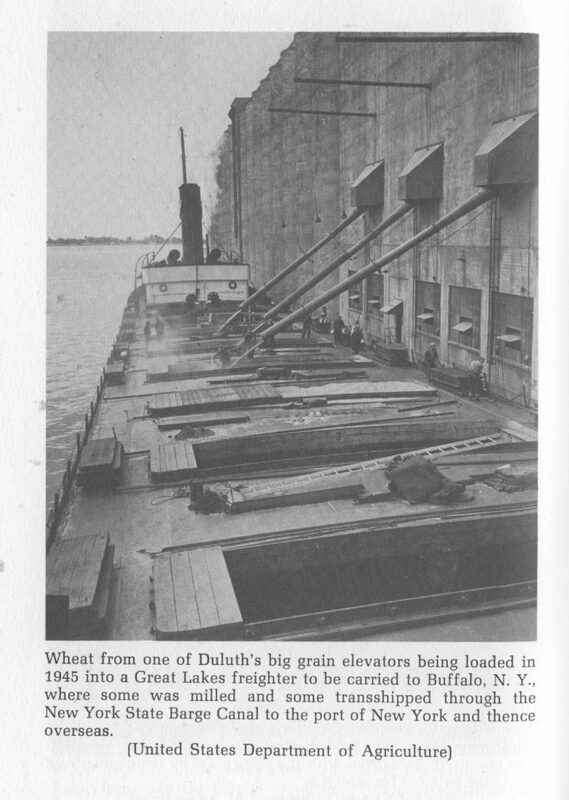 Grain elevators, mills, bakeries, sugar refineries, dairies, cold stores, feedlots, and abattoirs replaced smaller institutions and were often clustered in particular geographical zones (ports, urban peripheries). This substantial scaling-up of production involved new forms of construction, manipulation, and mechanization. Milling, baking, and refining, for example, became complex technological processes. Such economies of scale facilitated the accumulation of waste materials in sufficient quantities to make possible the profitable reuse of very small, biologically distinct parts of animals: abattoirs harvested glands for the pharmaceutical industry, for example. Contemporary food systems have a number of defining characteristics. They consist of critical nodes linked by very long transportation and distribution chains. There is a quite substantial amount of slack between component parts; for example, between abattoir and fast food restaurant. This means that food disasters emerge slowly, unspectacularly, and insidiously, unlike, say, meltdowns in nuclear reactors or explosions in petrochemical plants (Perrow 1984). Moreover, despite the best efforts of those building them, food systems are never fully insulated from their environments: they are “ecotechnical,” blurring the boundaries between “technology” and “nature.” Their size, shape, and complexity necessitated governmental strategies such as inspection, but they remained impossible to fully predict and police. 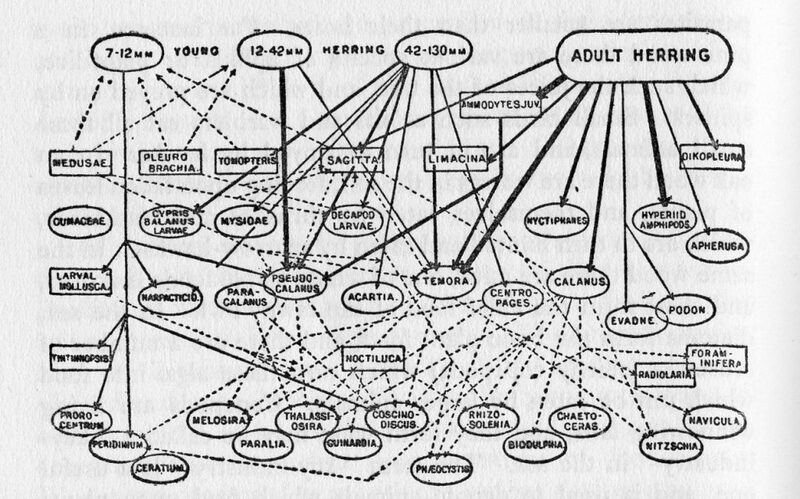 A working definition of complex modern food systems would include the significant distance between component parts and their openness, sprawling extent, and nodality: they are slack, slow, porous, opaque, and vulnerable (Hughes 1983). The food system itself is a metasystem composed of multiple, interlaced subsystems. For example, the Danish bacon industry grew up symbiotically with the dairying system: skimmed milk left over from making butter was fed to pigs. The scaling-up of food systems thus produced historically novel ecologies: distended chains of controlled cold, for example, or the industrial slaughter of mass agglomerations of mammals. As complexity theorists have noted, when a system increases in scale, it frequently displays emergent properties. Emergence refers to the capacity of systems to generate genuinely novel phenomena: they are surprising. I conclude by examining one such emergent property of food systems: their tendency to create the ecological conditions of emergence and distribution of new forms of pathogen. Viewed from the perspective of the microbiome, food systems were novel forms of evolutionary space. They provided new physical environments within which natural selection operated. Across food systems, strange new forms of life appeared: molds and slimes clinging tenaciously to the surfaces of frozen carcasses, or wingless insects devouring wheat in granaries. In the 1880s, western European public health officials began to observe an increasing incidence of various types of food poisoning. These cases, they realized, were related to the physical conditions produced within modern food systems. Modern food poisoning was a consequence of extended food chains, their ecologies, and the food habits they engendered: prepared foods were more frequently cooked, cooled, and reheated, which gave pathogens opportunities to slowly multiply. Meat products and canned meats were particularly dangerous, especially foods like pork pies, whose jelly was an “admirable nutrient media for bacteria,” particularly when slowly cooled (Savage 1920:168). 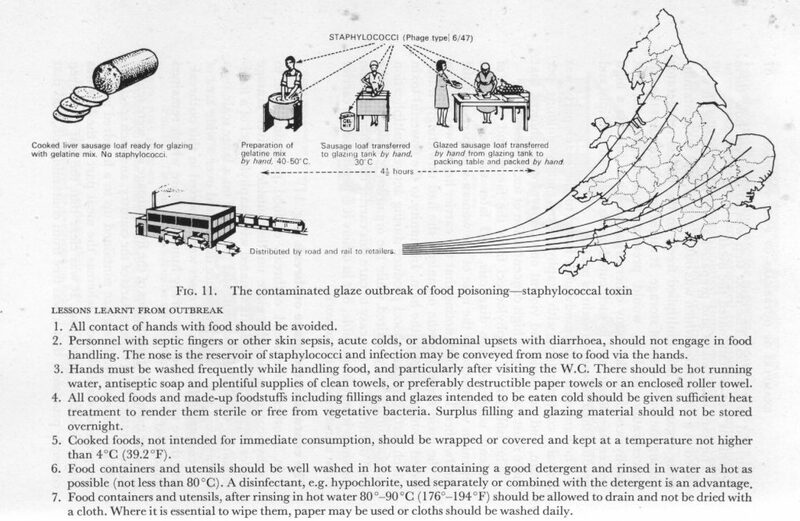 Food handlers often displayed inadequate hygiene, not least because of poor sanitary facilities. This process involved the effective distribution of previously unknown pathogens and, in some cases, the actual emergence of entirely new microbes that crossed species barriers as a result of the form of food systems. 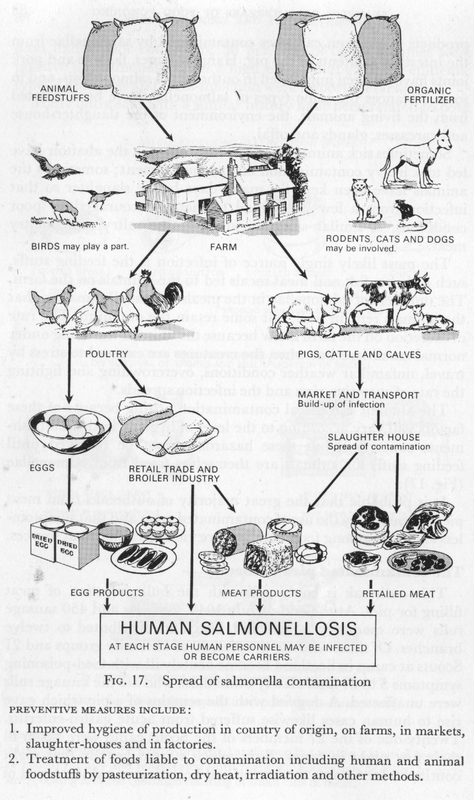 Salmonella was first identified in 1888: by 1962, 700 serotypes had been identified (Taylor 1962:15). Listeria was first recognized in 1929, and Escherichia coli O157: H7 was first recorded in 1982: the emergence and circulation of both appear to have been the result of intensive, industrial food production, particularly the development of the meat industry (Armstrong et al. 1996; Ojeniyi et al. 2000:306; Pennington 2003:96). In the same year, the term prion was first used to refer to numerous similar, but novel, disease agents apparently causing several mysterious brain diseases in humans and animals, including bovine spongiform encephalopathy (BSE) and Creutzfeldt-Jakob Disease (CJD) in humans. BSE had afflicted more than 36,000 cattle by 1992, and the British government responded by culling more than 100,000 cattle. BSE was an unpredictable consequence of decades of feeding cattle with meat and bonemeal recovered from abattoir waste. This practice can be dated back to late nineteenth-century meat complexes in South America, where cattle were described as being initially “reluctant” to eat it (Siderius 1893:30 cited in Schwartz 2003:146–47). Vague concerns were raised about the practice, but the assumption was that heat treatment would sterilize any disease agents (Moulton 1929:310). Unfortunately, and unpredictably, this new disease agent proved highly resistant both to heat and chemical disinfectants. Herring. From Charles Elton, Animal Ecology. Food systems can best be conceptualized as giant “ecotechnologies” which extract, process, and distribute vast amounts of edible matter to human populations. They have generated unprecedented abundance for most inhabitants of the global north. Like all giant systems, however, they have also produced many unintended consequences, such as the globalization of epizootics, or the genetic homogenization of foodstuffs. One particularly important unintended consequence of large-scale food systems is the production and circulation of new and deadly pathogens. Food systems have thus generated, evolutionarily, novel foodborne risks that have produced reactive mitigation strategies ranging from Pulsenet, the American network that coordinates the molecular subtyping of foodborne pathogens, to mass cattle culls such as those seen in Britain following the BSE crisis. These heterogeneous strategies—some sophisticated, some brutal—illustrate the impossibility of fully governing large-scale food systems, an impossibility ultimately rooted in the fertile agency of life itself. Armstrong, Gregory L., Jill Hollingsworth, and J. Glenn Morris, Jr. 1996. “Emerging Foodborne Pathogens: Escherichia coli O157:H7 as a Model of Entry of a New Pathogen into the Food Supply of the Developed World.” Epidemiologic Reviews 18(1):29-51. Bear, William E. 1888. The British Farmer and His Competitors. London: Cassell & Company. Capra, Fritjof. 2005. “Complexity and Life.” Theory, Culture and Society 22(5):33-44. Halweil, Brian. 2002. Home Grown: The Case For Local Food In A Global Market. Washington, DC: Worldwatch Institute. Hughes, Thomas. 1983. Networks of Power: Electrification in Western Society. Baltimore: Johns Hopkins University Press. Moulton, C. Robert. 1929. Meat Through the Microscope: Applications of Chemistry and the Biological Sciences to Some Problems of the Meat Packing Industry. Chicago, IL: University of Chicago Press. Nye, David. 2006. Technology Matters: Questions to Live With. Cambridge, MA: MIT Press. Pennington, T. Hugh. 2003. When Food Kills: BSE, E Coli, and Disaster Science. Oxford, UK: Oxford University Press. Pfeiffer, Dale Allen. 2006. Eating Fossil Fuels: Oil, Food and the Coming Crisis in Agriculture. Gabriola Island, BC, Canada: New Society Books. Savage, William G. 1920. Food Poisoning and Food Infections. Cambridge, UK: Cambridge University Press. Schwartz, Maxime. 2003. How the Cows Turned Mad. Berkeley: University of California Press. Siderius, C. 1893. L’Alimentation des animaux domestiques, formulaires de rations. Paris: Ballière. Smil, Vaclav. 2006. Energy: A Beginner’s Guide. Oxford, UK: Oneworld. Taylor, Joan. 1962. “Salmonella and Salmonellosis.” In Food Poisoning: Symposium, edited by W. Charles Cockburn, Joan Taylor, E.S. Anderson, and Betty C. Hobbs. London: The Royal Society of Health, p. 15-32.